I’ve been planning intending to unofficially take part in 365 Days of Print for the last few months and…well, better late than never. The Daily News-Miner is, I feel, in a more unique position than the newspapers located in the lower 48. Fairbanks is hundreds of miles from any other city and The News-Miner is the only game in town. A lot of the locals like to poke fun at the paper or take issue with its perceived political stance, but I like it and I find it to be a very useful source of information. (And I’m not just saying that because they occasionally hire me to write for them). I’m not sure what form my collages and/or cut-ups will take or if I will actually keep up with creating something every day. 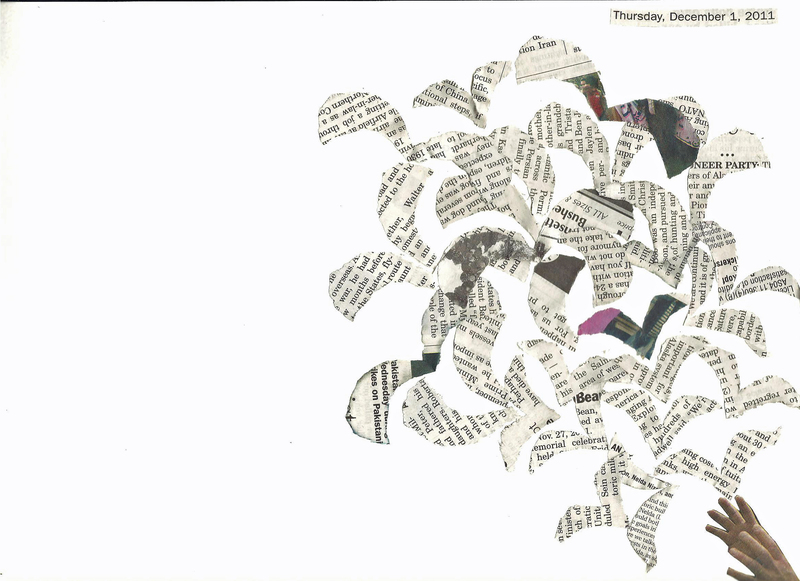 Today’s collage, “December 1,” is from yesterday’s paper. It’s been a while since I’ve made any collages and I wrestled with it for a while. It took 3 other forms before revealing itself to me. If I had to explain it I’d say it has something to do with grasping at meaning or trying to find what it is that you want to say. Or else, it has something to do with our inability to control messages or the flow of information that’s thrust upon us all day. Let me know if you see something different. I am not sure if it’s just nostalgia or my inability to accept change but I do love a good ol’ fashioned newspaper and love the feel and smell of magazines. Good luck on the project, it sounds pretty cool. This entry was posted on December 2, 2011 by AK in alaska, art, musings, seen and tagged 365 days of print, alaska, art, collage, daily news miner.